My recent purchase of an ElliptiGo resulted in having to work out transportation options. It will fit inside my 2000 Toyota Sienna, but it is a real pain. So I looked into other methods, and getting a hitch mount rack was the way to go. Later on, I learned I could use the hitch to pull a trailer too! 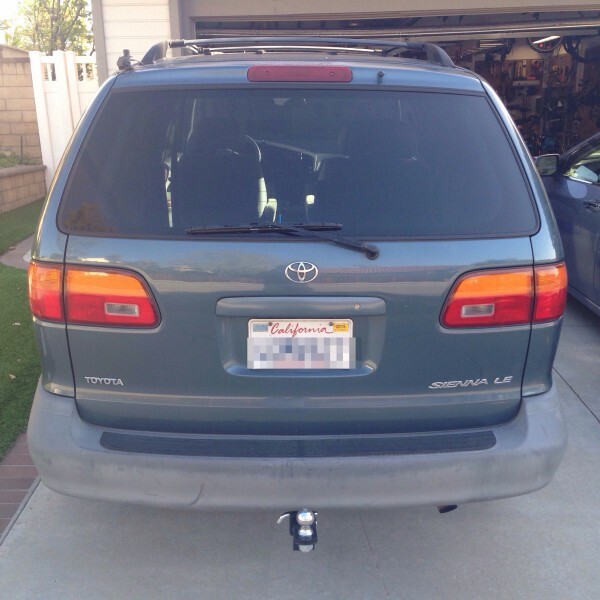 I installed the Curt 13511 hitch mount in less than ten minutes. 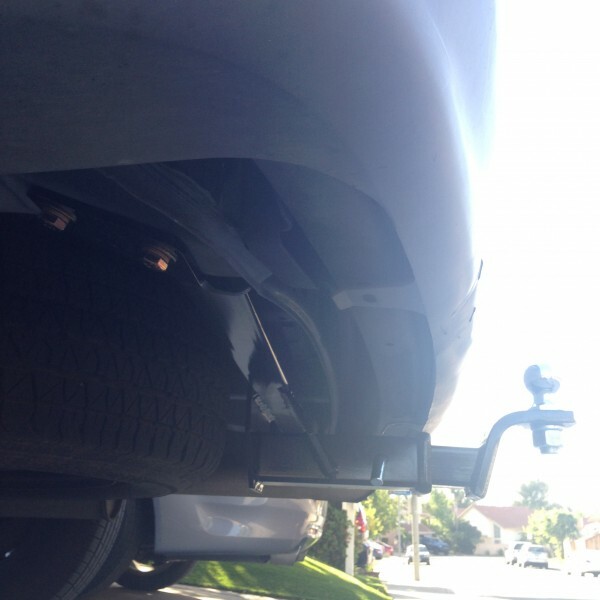 I first had to unbolt the tow hooks on each side of the vehicle. 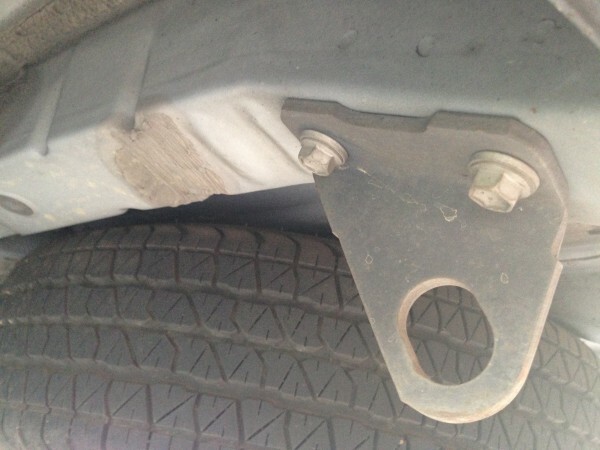 Then the hitch was mounted using the provided bolts, using the same holes and the manufacturer’s weld nuts. The only somewhat tricky part was lifting it over the exhaust. It’s nice to have a helper do this for you. My hitch is slightly off center. That’s because I was rear ended years ago, causing the right side of the vehicle frame to get pushed in about half an inch. There was enough wiggle room in the mounting holes that it wasn’t a problem to install the hitch, though. 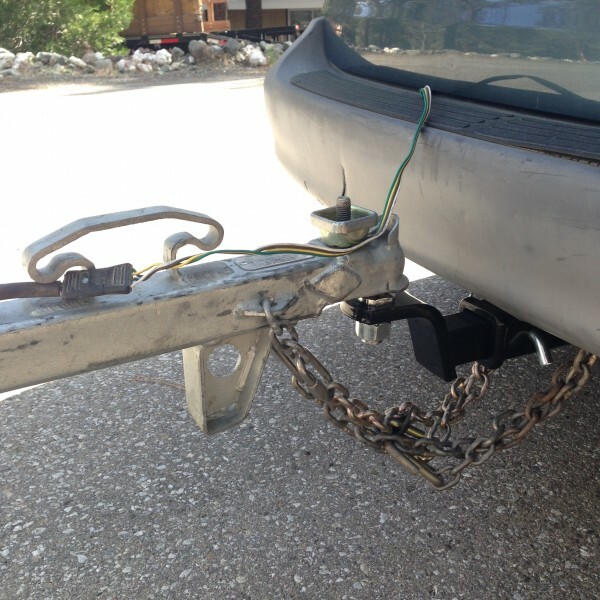 If I had known it was this easy to install the hitch (on this vehicle), I would have done it years ago! The Hollywood Racks 1450R hitch mounted rack, with slight modifications (flipping the wheel holder over and installing a fork mount), is one of the few that will work with the ElliptiGo. Here it is folded up. You can more clearly see here that the hitch isn’t perfectly centered. 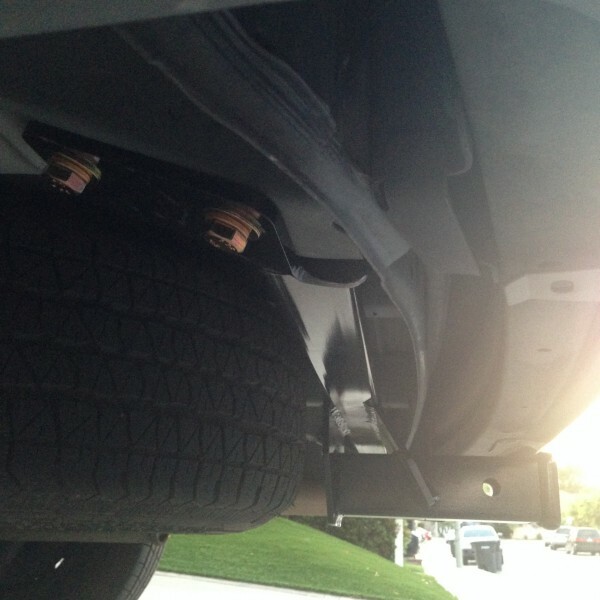 The right side of the rack is about an inch closer to the bumper compared to the left side of the rack. No big deal. A side view of the rack folded up. Hmmm, now that I had a hitch mount, the thought of pulling a trailer entered my mind. Then I wouldn’t have to borrow a truck for my annual yard cleaning at the mountain cabin. 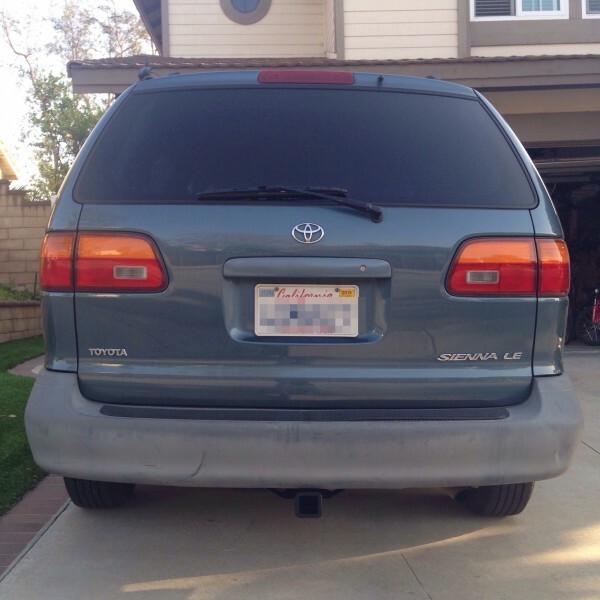 As far as I could tell, here are the maximum weights for the first generation Toyota Sienna. All I needed was a ball and hitch. And then I needed to install a wiring harness for the taillights and brake. I got the Curt 55418. I forgot to take photos of the install, just a photo at the end of a bunch of new clips I had to buy to replace the broken ones from removing the interior panels. Now what about the towing package? From discussions I read online, the most important thing is that the towing package has the extra transmission cooler. I was also concerned about that, because I had to have my transmission rebuilt a few years ago. I also read that all the first generation Siennas had the extra transmission cooler already installed. But I wanted to confirm it first hand. I took a photo looking down into the engine compartment. 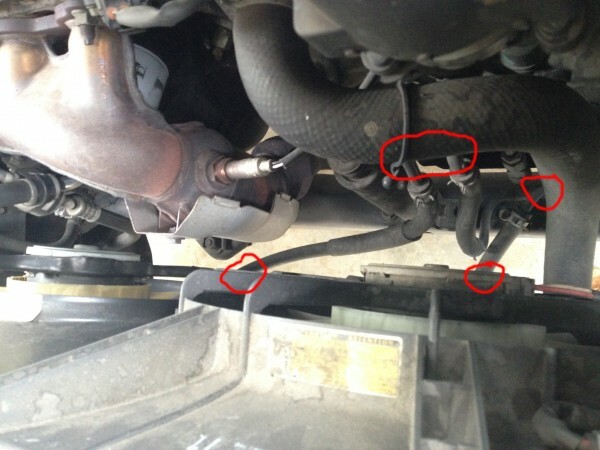 The top two lines I circled are the fluid to/from the transmission. 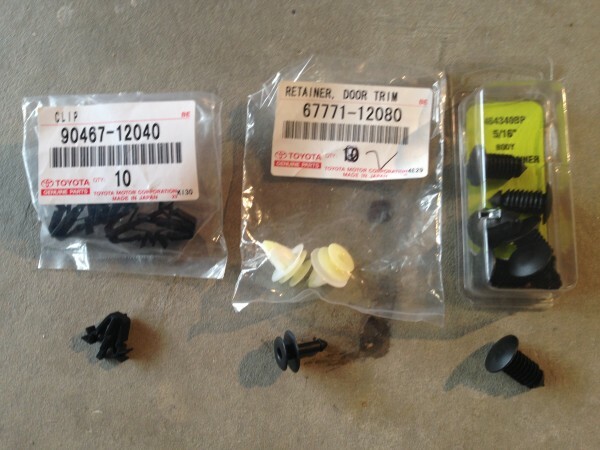 The two on the bottom are to/from the transmission cooler by the But what about the two on the right? 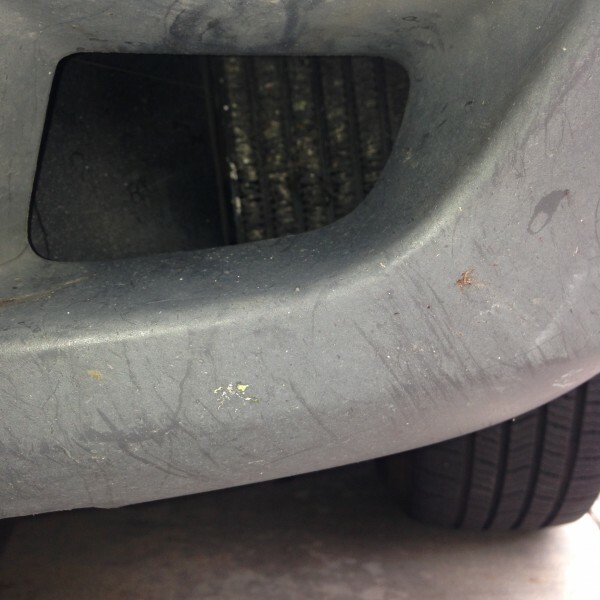 Those two lines go over by the front air scoop in the bumper just below the driver’s side headlight. Looking inside, sure enough, there was an extra transmission cooler! This weekend was annual yard cleaning at the mountain cabin. 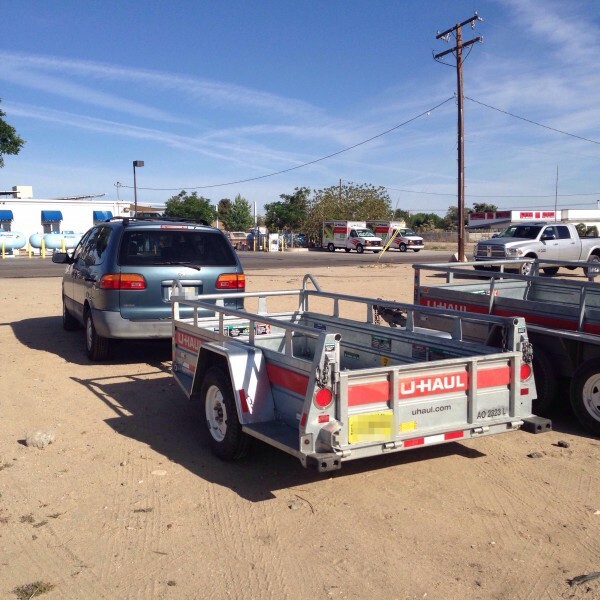 What size trailer to rent, 4′ x 7′, 5′ x 8′, or 6′ x 12′? There are no 4′ x 7′ at the local U-Haul, so that option was out. It was either the 5′ x 8′ which doesn’t have a brake, or the 6′ x 12′ with a brake. 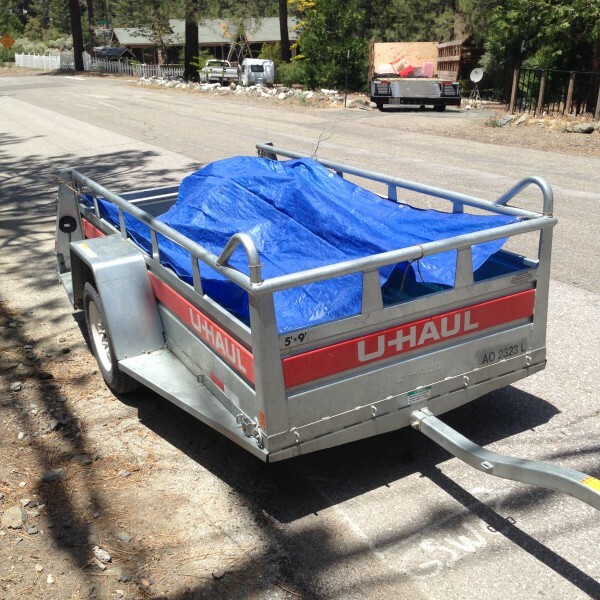 Since I had to drive it up 2000 feet in 8 miles to the cabin, I opted for the smaller and lighter trailer. At 1000 lb for the trailer I am technically at the limit without a trailer brake. But my load would be just light pine needles, and I would only be driving my load in town at 20 mph on local streets, so I didn’t see an issue with being unable to stop when fully loaded. Flipping the ball mount upside down put the trailer at the perfect height. Also, since I’m not pulling a trailer very often, I just left the wiring harness inside the van, rather than trying to find the grommet to run it underneath down by the hitch. It’s OK to close the rear door on it, as long as the wiring is kept away from the latch in the center. Turns out it says 5′ x 9′, not 5′ x 8′. But it looks like the 5′ x 8′ on the U-Haul website. The van survived pulling the trailer up the mountain. And the brakes were able to handle getting it back down! This entry was posted in Cabin, Tech on May 31, 2015 by BikingBrian. Great post, Brian. 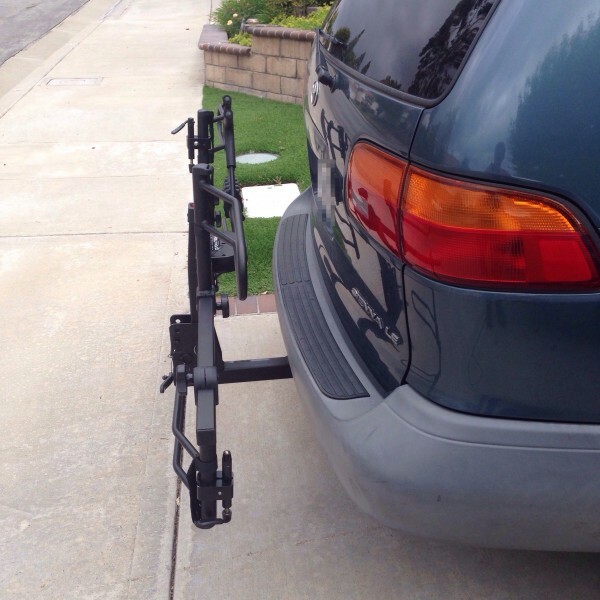 I love the trailer hitch mount using the tow mount screw holes. 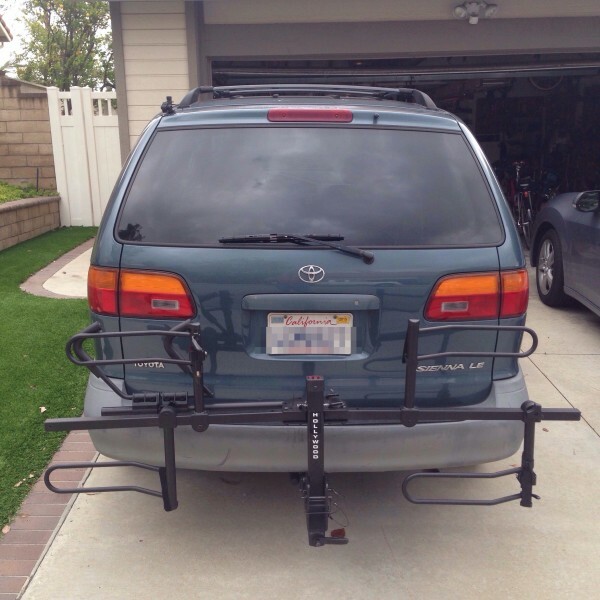 The bike rack seems to protrude from either side of the vehicle so does that make you feel any different driving it? Or is it harder to back into a parking space, even with it folded up, for example? It’s funny, what makes the trailer hitch work so easy for the first generation Siennas is that the back row seats don’t stow down below (they can only be removed), giving enough room for an easy install and allowing the hitch to be at a reasonable height. The second and later generations are noticeably lower in the back to make room for the seats. Actually, the photos are a bit of an optical illusion with respect to the rack width. 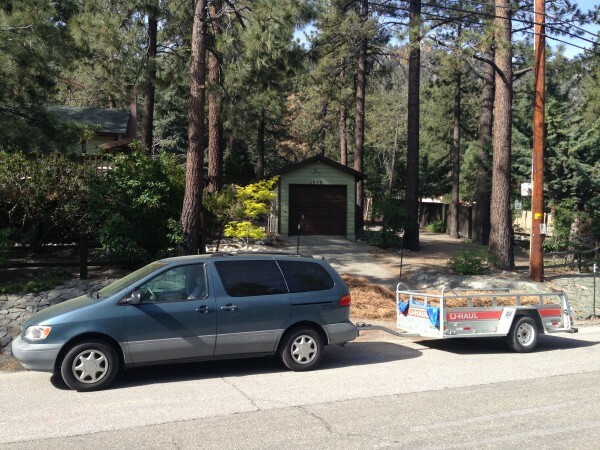 The rack is 67″ wide (after moving in the wheel holder which was too far right), and the back of the van is 63″ wide. 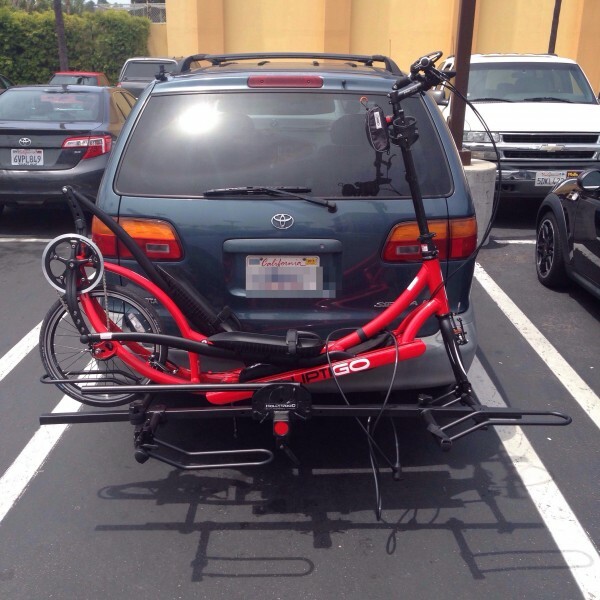 But the van is wider in the middle, definitely more than the 67″ for the rack. Even the ElliptiGo on the rack (when the pedals are in the proper orientation) is narrower than the van, I don’t see the sides protruding when driving. No issues driving with the bike rack, the hardest part is parking due to the added length. When the rack is folded, it only increases my length by about a foot, so all I really need to do is make sure I am all the way forward in the parking space. When the rack is unfolded, then I have to be more aware of where to park. Sometimes that means backing into a space so that the rack can go over a planter or curb. Other times it means parking a little further away from the main traffic flow in the parking lot. One more thing I forgot to mention: I have to be careful to make sure I don’t scrape the bike rack going in and out of driveways, etc. 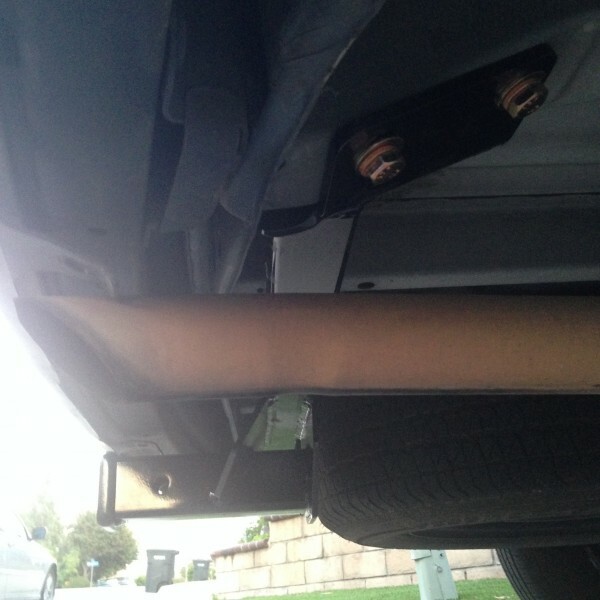 Though my hitch and rack are high enough that it’s not a problem most of the time; people with hitches on sedans generally need to be more concerned. With the bike rack folded, I barely scraped its bottom edge when backing down out of my driveway at the mountain cabin. Then again, that transition from driveway to street is sharp enough that I almost always scrape the front of my wife’s Acura when backing it out of the same driveway.